I remember once asking an English teacher of mine what he thought constituted a good book. He replied that it was a book where getting to the end of it was not enough – you wanted to know what happened to the characters beyond the last page, for the rest of their lives. I have always found this explanation to be a simple, yet satisfying one. With so many books you get to the end, put it down, and never think of it ever again; they were entertaining enough, but instantly forgettable. With others, though, you find yourself reaching the end of the story and desperately wanting to know more. “Fatherland”, for me, certainly falls into this second category. It may not be the most accomplished or the most original literature I have ever read, but it had that X factor that compelled me to read on, and to try and work out what happened after the book had finished. I have been left with the story hovering around my mind since I finished reading it; I can’t help but wonder about the futures of the people I have been reading about. “Fatherland” opens as all good crime thrillers do, with the discovery of a body. In this case, it is of an elderly man who is washed up on the lake shore near one of Berlin’s most exclusive areas, and it is the job of that other crime thriller staple – the dogged and brilliant loner detective, complete with a drink problem and bitter divorce – to solve it. Our hero is Xavier March, an officer in Berlin’s kriminalpolizei, called in from a rare day off to process the case. It doesn’t take March long to realise that there is something decidedly odd about this case, though; the man is soon identified as a prominent member of the Nazi party and a participant in the failed putsch of November 1923. Further investigation reveals that other high-ranking members of the Party have also recently died in mysterious circumstances, and evidence points to SS complicity in their deaths. March and his sidekick – an American journalist, naturally blonde and beautiful – have just six days to find out the truth behind what is happening. Why six days? Because on April 10th 1964, Germany will celebrate the Fuhrertag, a national holiday marking Hitler’s 75th birthday, an event with added significance this year due to the impending visit of the American president as a symbol of détente between the two countries. Excuse me? 1964? Yes, that’s right. “Fatherland” is not just a crime novel, it is also an alternative history of the way the world nearly was. Asking himself “what if…?”, Robert Harris has tweaked history a little bit to create a world order that is both strange and yet frighteningly recognisable to the reader. In this world, something went slightly different to our own timeline in 1942 that started a chain of events off, effectively creating this intriguing alternative reality. While the details of these events are never specified by Harris, we do get tantalising glimpses into how small differences can have a big impact in history. For instance, German U-boats sunk enough supply vessels to starve Britain into submission, leaving Winston Churchill “and his band of warmongers” to flee to Canada. The V-3 rocket missile that was intended to be launched at New York in our reality, actually was launched in this world, effectively keeping America out of the war. The result is a 1964 in which the Greater German Reich spreads from the Rhine to the Urals, in which countries such as Poland and Czechoslovakia no longer exist, in which the Reichsmark is the common European currency; it is truly Deutschland Uber Alles. However, despite this dominance in Europe – both politically and economically – March has always felt that there is something not quite right with the Reich. Despite being an outward patriot, he was never much of a believer in Nazism, and secretly fosters suspicions about what happened to all the Jews who were moved east for “resettlement” during the war. In particular, he has become obsessed with the family in a photo he finds hidden in his apartment, a family who are amongst those who have disappeared from the new Germany. Despite his best efforts to find out what happened to them, it has proved maddeningly futile, not to mention the fact that it has brought March to the attention of his superiors, who don’t like people asking about “the Jewish question”. “What do you do”, he asks, “when you devote your life to discovering criminals, and it gradually occurs to you that the real criminals are the people you work for?”. “Fatherland” works well as both a thriller and a history novel; it is fast paced, compulsive reading with an abundance of thought provoking ideas working away just under the surface. Whilst March and his unlikely sidekick always seem a little flat and two-dimensional – it is easy to emphasise with their situation, but rather harder to do so with them personally – I never found this got in the way of the narrative. The only obstacles to the flow of the story, to me, were minor points, such as the insistence of Harris in using German words and phrases rather liberally to add atmosphere to the book. It does indeed do this, but if you are like me and only understand a few words of German, then it can get a trifle overbearing and frustrating; a simple glossary of terms at the back of the book would have helped enormously, I think. The other point is in the knock-on effects in the histories of countries outside of Germany, which are mentioned from time to time. It may be possible to stretch your imagination to see why King Edward and Queen Wallis are ruling Britain, but would a Liverpool of this world really have produced the exact same Beatles that we know in ours? As an author of previous non-fiction works on Hitler and Nazi Germany, Harris certainly knows the era and its politics very well indeed, and has done an admirable job of extending them into a fictional 1960s. Many of the people (such as Reinhard Heydrich, Artur Nebe and Martin Luther) and most of the set-up of March’s Germany are founded in reality; indeed it is quite shocking how little Harris has had to tweak history to get the desired result. However, he never tries to invoke the demons of Nazi Germany simply by dropping in names of those we now most associate with evil acts; Goebbels, Himmler and Goering are only present in landmarks, rather than actual people. The veil of silence, fear and suspicion that hangs over Berlin is almost tangible to the reader and gives an edge of realism to the book – it isn’t ever overplayed, you feel that this is how it could have been. I suppose that is another thing that makes books of this genre good – the ability for the reader to suspend their disbelief well enough to become involved in the world it describes. However, you can read much more into this book than just the story; it does have moral undertones as well. It is clear from “Fatherland” that the American and British governments are not deterred from their desire to end the Cold War and reach détente with Germany by the “disappearance” of millions of Jews. You can almost feel the sentiment of “just how these governments ignored the suffering of ordinary people in reaching a settlement with the USSR” as an undercurrent to the text. In this way, the book is quite disturbing and almost subversive; yet it manages to both entertain and raise moral issues in a more accessible and imaginative way than most historians could muster. What more could you ask from a historical thriller than that? After all that, I think I can recommend this book to readers of 15 and upward, especially those with any interest in Nazi Germany or alternative history theories. I am not normally a reader of political thrillers, but I found myself enjoying it despite this. One last point, though – although you can read this book with no knowledge of the historical background from which it is drawn, to get the most from it you do need at least some prior knowledge. 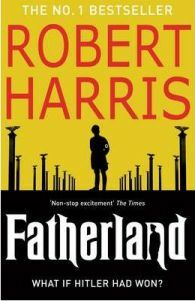 “Fatherland” is by Robert Harris – it was published in 1992 by Hutchinson. The hardback edition is RRP £16.99, with the paperback RRP £6.99, although you can get both much cheaper now as it is quite an old book. No Comments on "Alternative History of Fatherland"